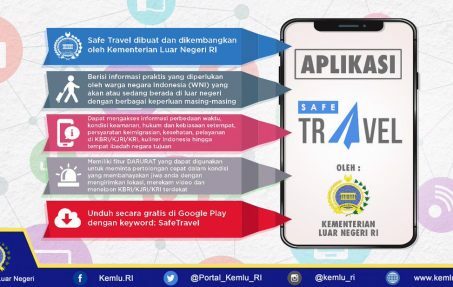 Developed by the Foreign Ministry, the newly launched Safe Travel app is intended for Indonesian citizens who are planning to travel overseas or are currently living abroad. Launched on Saturday, Apr. 14, the app is available on the Apple Store and Google Play Store. The app caters to many purposes, starting from studying, working and umroh trips (minor hajj). Among the information Safe Travel provides are time differences, security, laws, local customs, immigration requirements and locations of houses of worship. Users can create an account, users will also receive notifications on travel warnings for the countries they are currently in. Users can select from among several menus on the app’s homepage. Fun Facts, for instance, is filled with unique information about different countries. Meanwhile, Tips gives suggestions for different users, including Indonesian migrant workers (TKIs). Safe Travel also has an emergency feature to call for immediate help when users need assistance. 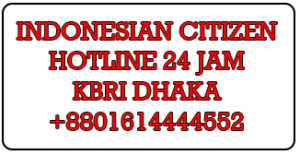 They can send their location, record a video and contact the nearest Indonesian Embassy (KBRI), Indonesian Consulate General (KJRI) or Indonesian Consulate (KRI). 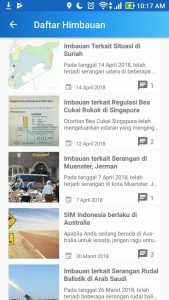 The Foreign Ministry collaborated with Yogyakarta-based IT company PT Gamatechno Indonesia in developing the app.